Atishoo! Atishoo! You need a tissue! Why Do You Need a Tissue? First, think of a small particle of pollution – it looks like something like a ball with spikes. Now think about this prickly invader entering your nose and sticking to the soft membranes within. These mucus membranes are present on our bronchial and nasal passages and have immune cells. The immune cells or mast cells are loaded with histamines and receptors that work like a panic button. When allergens – such as particles of pollution, dust, pollen, perfumes, mold or animal dander – touch the receptor cells, it alerts the mast cells, which cry out “STRANGER DANGER!” and release the histamine. A runny nose, scratchy throat and rheumy eyes is because the histamine has reacted to the battle cry of the mast cells and is trying hard to get rid of the intruder. We then think we have allergies. But wouldn’t it make more sense to shore up your defenses *before* your body goes into attack mode? Here is where Ayurveda can help with natural treatments to build immunity as well as show you how to relieve allergies fast by knowing what kind of allergy you have. Your primary dosha, or mind-body constitution, can lead you to understand your allergies better. 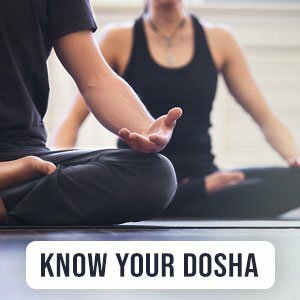 If you don’t know your primary dosha, you can take our quiz to find out. Depending on what your dosha is your allergies will manifest different. Fiery Pitta shows up as red eyes and inflamed, itchy nose and sinuses. You could also have a low-grade fever and feel irritable all around. If you go out into the sun, you will start sneezing non-stop. Pitta allergies can also manifest as a skin rashes and pounding headaches. Pollen is the main culprit behind Pitta allergies. To pacify Pitta, Ayurveda advises cooking with cooling herbs such as coriander. Apart from these herbs such as guduchi, amla, aloe and neem are natural remedies for allergies and sinus. They can boost immunity as they are packed with anti-inflammatory and antioxidant properties. Eat foods that are rich in ghee to soothe the sinuses and calm any inflammations. A Kapha allergy can be heavy and moist (think lots of mucus) just like the dosha. If you have a dull, heavy feeling in the head, a clogged nose and stuffy sinuses, sleepiness and swollen eyes, it’s a Kaphagenic allergy attack. Damp, moldy allergens are the prime offenders of this type of allergy and can even lead to asthma in some. There is a reason that Neti pots look like Alladin’s lamp. They can magically flush away the allergens and clear out Kapha from the head and sinuses. Use a Neti pot with a saline solution to breathe better. A tea made with warming spices such as ginger, cinnamon, pepper, cardamom and turmeric can be extremely healing and relaxing. Place a few drops of eucalyptus, camphor or juniper essential oils diluted in sesame oil into each nostril (nasya) for a natural decongestant. Chyavanprash is a time-tested remedy for enhancing immunity and keeping Kapha-related allergies at bay. Another excellent Ayurvedic remedy for allergy and sinusitis is triphala. Steep half a teaspoon of triphala in boiling water. Strain and drink up! Ayurveda recommends staying away from Kapha-causing foods like wheat and dairy products at this time. Dust can bring on a Vata allergy attack which could cause the throat and lungs to run dry. You know you have a Vata allergy if you have a feeling of excessive dryness and discomfort in the throat, nose and sinuses. You will also suffer from headaches, achy muscles, dry eyes and feelings of restlessness. Asthma attacks with spasms may occur in very severe cases. Natural remedies for allergies and sinus related to Vata dosha can be placing a few drops of sesame oil into each nostril to lubricate the dry nasal passages. Drink licorice (mulethi) or ginger tea to relieve the raspy throat. Immune modulators like ashwagandha can be of great help for Vata allergies. Dissolve a teaspoon of ashwagandha in a cup of warm milk during bedtime.